ROAD TOWN, Tortola, VI- A stalwart senior citizen and centenarian, Mrs Christalia Gibbs-Hodge, has died. 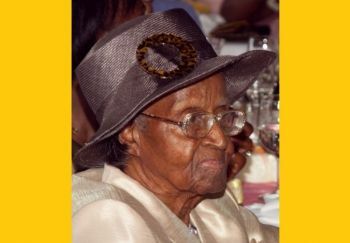 Christalia, who this news site had featured during Senior Citizens Month in May 2017, passed away on Monday March 26, 2018 at age 101, having been born on Sunday January 7, 1917. In 1943 Christalia became a member of the Road Town Methodist Church and served as a class leader for years, as well as in the kitchen assisting with meal preparations. In 1956 she joined the Road Town Women’s League and looked forward to attending meetings on Wednesdays in rain or shine, and was honoured by the League for her faithful service. The late Christalia was a woman who believed in being punctual and in her later years when she had to be taken to any function or meetings she would let her caregivers know she was not pleased about being taken there late. She was a member of the Road Town Senior Citizen’s Group and has cruised most of the British, Dutch and French Caribbean Islands and the US Virgin Islands, Puerto Rico and Florida. Christalia was the daughter of Albertha Todman- Blyden and James Gibbs of Anderson, Brewers Bay, Tortola. According to family members of the deceased, the viewing and funeral service for the late Christalia Gibbs-Hodge will take place at the Sea Cows Bay Methodist Church on Friday April 6, 2018. Viewing will begin from 9:00 A.M. and service at 10:00 A.M.
Burial will take place at the Road Town Methodist Cemetery. The management and staff of Virgin Islands News Online express sincere condolences to the family and friends of the bereaved. Condolences to the family...101? wow. Lots of BVI history gone there. To lshmael and Ishma I wish you both lasting and fond memories of who mother was and the Christian principles by which she loved and lived her life. She was a true methodist and a true LADY. I thank God for the life of Mrs Chrissy. She was a great mother and grandmother to more than her biological children. I still remember Mrs Chrissy's cooking and baking. Jesus, himself said, "Blessed are the peacemakers; for they shall be called sons/ daughters of God. May God bring peace and comfort to the hearts of the family, that moan.